Step 1 In the bowl of a standing mixer fitted with a paddle attachment, mix the unsalted butter until slightly soft. While this is mixing, combine the sugar and dark brown sugar, then add this in a stream to the butter. Add the molasses and then the egg. Mix until uniformly combined, then stop the machine. Step 2 Sift together the flour, baking soda, baking powder, ginger and cinnamon. Add half to the mixing bowl and resume mixing slowly. When the mix becomes crumbly, stop the machine again and add the remaining half of the dry ingredients. Resume mixing until all of the ingredients are uniformly combined. Refrigerate the dough until chilled throughout, at least 4 hours. Step 3Heat the oven to 325 degrees. Roll the dough out on a lightly floured surface to three-eighths inch. Stamp out two 2 1/4-inch circles for each cookie, then cut a quarter-size hole in the center of one circle (this will be the top of the cookie). Repeat to use all of the dough. Step 4Place one circle of dough (the bottom of the cookie) on a baking sheet lined with parchment paper. Place one tablespoon of apple butter in the center of each piece. Place the top gently onto the bottom. Gently press around the edge to secure it to the bottom. Space cookies 2 inches apart to allow for spreading. Step 5Bake 15 to 20 minutes until edges are lightly browned and cracked. Let cool for 30 minutes; these are best when completely cooled. In Recipes-list.com we have selected the most viewed recipes from category - Desserts . Enjoy the best recipes specially selected for you! 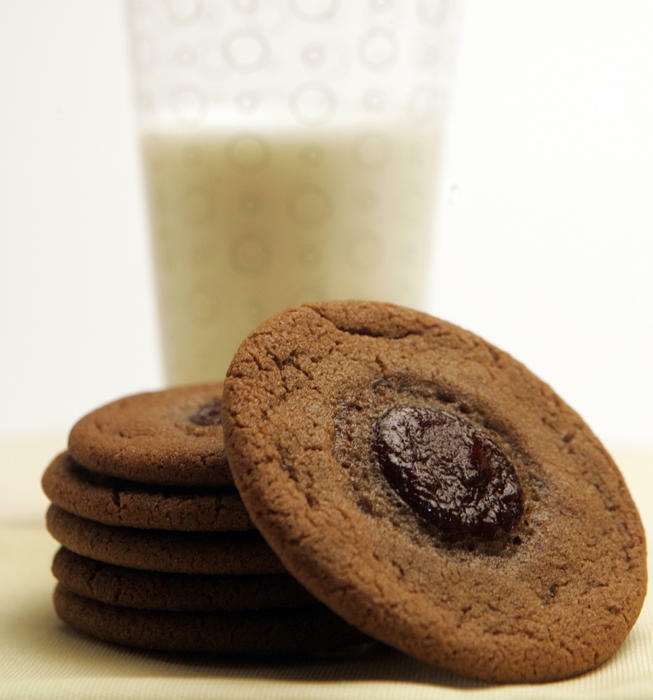 Apple-butter-filled gingerbread cookies is the right choice that will satisfy all your claims.